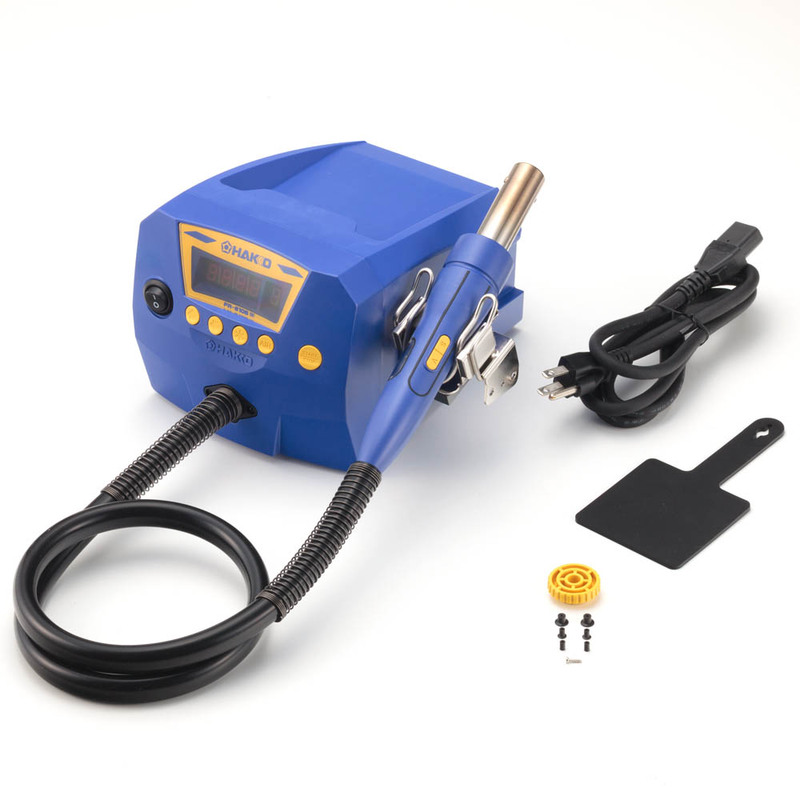 The HAKKO FR-810B is ideal for removing SMDs and includes an integrated vacuum pickup system with a special visual indicator in the handpiece that allows the operator to visually see when the component has completely reflowed and is safely lifted from the pad. 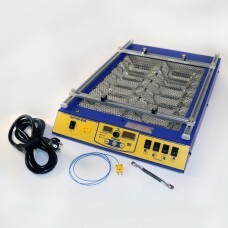 The HAKKO FR-810B Hot Air Rework Station sets a new bar for convective rework. 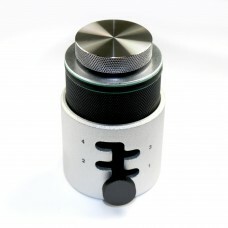 The new, compact and lightweight design (only 3.3 lb.) features a quiet, self-contained turbine air supply, capable of delivering up to 115 L/min.. The new heating element design improves durability, provides a top end temperature of 1120°F (600°C) and eliminates the quartz glass insulator tube. 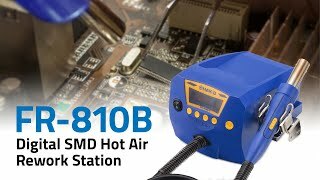 The FR-810B includes an integrated vacuum pickup system that includes a visual indicator for reflow, allowing the operator to visually see when the component has completely reflowed and is safely lifted from the PCB. This special feature allows the operator to lift the handpiece without fear of damaging the pads or leads. Additionally, new N51 Series quick-change hot air nozzles for SMT components that are specifically designed for use with the new vacuum pickup system are also available. These newly designed nozzles are compatible with the HAKKO FR-810B and FR-810, and the "older" nozzles from the HAKKO FR-810, FR-803B, FR-802 and FR-801 hot air stations are also compatible with the FR-810B. Note: Please be careful when using "older" HAKKO N51 Series nozzles as some select nozzles are NOT compatible with the vacuum pick up feature and can cause damage to the unit if used improperly. Please see Product Bulletin 381 (PB381) "Change to N51 Series Nozzles" and the FR-810B User Manual, section 4 for more information. Also, B5058 is no longer required to use "older" nozzles from the HAKKO FR-801, FR-802 and FR-803B with the HAKKO FR-810B. Please see Product Bulletin PB377 "B5045 Spec Change" for more information. (W x H x D) 6.3 x 5.7 x 8.7 in. 1Airflow capacity is rated as free flowing. Restrictions created by various nozzles may reduce the maximum airflow capacity. 2Under certain airflow and temperature setting conditions, the station may not attain the maximum allowable temperature selection. Note: Station does NOT include nozzles. Nozzles must be purchased separately. When ordering be sure to order a nozzle suitable for the work. C5028 Rework Fixture Handpiece fixture for the HAKKO FR-810, FR-810B and FR-811 hot air rework systems. 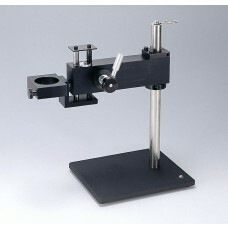 C5029 Rework Fixture Handpiece fixture for HAKKO FR-810B and FR-811 hot air rework stations. Rework Fixture for FR-801, 802, 803B Use this rework fixture with your hot air rework station.